Cuir is our third anniversary ale. It is the same recipe as Papier, but again created using the Solera method. Each year we will continue to blend old barrels of anniversary ale with a new batch of the same beer, adding an additional layer of complexity that will grow over time as we continue to age and blend with each anniversary, creating an older average age to the ale. Poured from fridge temp in January of 2019. Pours dark brown with substantial head. Nose is heavy oxidation, dark fruits, and a bit of toffee. Not overly appealing. Taste is better than the nose. Nice notes of toffee, Belgian yeast, bread, nuts, dark fruit, brown sugar, vanilla, and oak. Mouthfeel is nice and creamy. Overall, this has held up well despite a not-so-nice nose. T: Taste is toffee and caramel with raisins and some licorice. Other spice notes come in at times as well. Nice fruitiness from the Bruery house yeast as well along with a slight vanilla. Swallow is more caramel and vanilla with a hint of oak along with some lingering dark fruits, raisins and spice. M: This beer is big and slightly chewy in the mouth with soft carbonation that is adequate for the style. The beer has a drying finish which is to be expected for the style. O: Overall this is a really nice beer with some great flavors and some very nice complexity. This one isn't showing the slightest hint of oxidation either which is very nice. These are definitely drinking very well and I still have one left. Lucky me. Originally purchased for my 1,300th review on BA. It was not to be. This was pulled from "the cellar" of my local specialty beer shop. The third anniversary ale, brewed in 2011. Bottle # 05739 Black wax seal. Let's see how well it's aged in 6 years in the cellar. A Very cloud and opaque brownish color with some red hues. Mocha foam cap is pretty thick and short but smooth and dense. recedes pretty fast. Only a thing ring is left. The aroma has some oxidation hints..mainly wet cardboard. Then it's, smokey oak, old leather with spicy tones, herbal and earthy. The aroma is actually very complex. Mild chocolate and spices , toffee with wet earhy notes and heady, woody malt. Blackberries pop out later on. 75% new ale blended with 25% very old ale from Bourbon Barrels. The flavor is amped up in complexity! The malt layers is unreal. First, very sweet tones of maple syrup with tons of Bourbon Barrel boozy notes, smokey oak and vanilla, sugared dates, ovetly ripe dark fruits, boozy heat tingle, some sour tones from the hops and or yeast combo. Very "Sweet N Sour" overall, multiple flavor aspects derived just from the Bourbon Barrels, especially the oak and maple syrup. Earthy, herbal balance rides on in the finish with a slightly bitter, earthy ending. The malt flavor's just mutate and change in your mouth and as you swallow. Amazing depth of charecter. Long and smooth and kinda dry in the finish. Take your time with this one. The 14.5 % abv is no joke. A true sipper. The sweet and sour effect is very intense. You will find the overall complexity in all catagories to be a real challenge to experience. Only very mature audiences can attend this tasting! A: Lots of toffee/caramel aroma with a light barrel presence. A: Dark brown color, opaque, with a thin tan head that dissipates into the glass. T: Very rich malts with toffee/caramel notes, light dried fruits with a moderate barrel character with a sweet finish. M: Full bodied with light carbonation. The alcoholic strength is noticeable, but quite smooth. O: Awesome; the beer doesn’t exhibit oxidative notes, but the extended aging has also tempered the intense alcoholic warmth to really bring out the rich malt complexity. Popped open a 750-mL bottle I've been holding onto for god knows when. Poured into my Bruery snifter. Looks a muddy Amber color with some brownish off white head that quickly vanishes to some soapy bubbles. Bottle presentation was very nice with wax over standard bottle cap. Smells of cinnamon, allspice, brown sugar and molasses. There's a hint of some bourbon in there with light oak. Smells a little boozy but I'm guessing it has certainly mellowed over the years. Very sweet upfront with almost a syrupy or candied texture. Lots of brown sugar, sweet cherries, and molasses. A hint of bourbon & oak. Surprisingly smooth for 14.5% abv. Very full bodied & mellow although the booze does warm the throats after the 3rd or 4th sip. Sort of reminds me of cough medicine. Was worried about drinking this bottle all to myself but the smoothness really makes it quite approachable. I wish it had less cough syrup flavor, maybe more bourbon or more hops to add a tad more bitterness? This beer seems to have aged well. I only wonder how it was fresh. 2011 vintage; drank 4/1/16 @ Harvest Hop Haus. Nice khaki head; decent lace. Caramel & brandy notes in the nose. Caramel & brandy flavors up front; dry raisin notes on the finish. Surprisingly light on booze heat. Simple, but a nice treat. Served on draft at the Bruery Tasting Room as part of Orange County Beer Week. 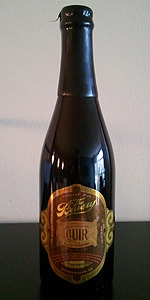 Really enjoyed this in the bottle over the years, but it seems to be past its prime; the pour I had exhibited all of the usual trademark flavors of The Bruery's anniversary ales, but it was heavily oxidized. Brown color, not as pretty looking as a lot of Bruiry beers. Small 1/8" head. Tan. Aroma is awesome, chocolate, vanilla, oak, coconut, brown malt, warming alcohol. Well done. Anniversary beers are legit. Taste was the first in the series to get good at hiding the alcohol unlike the previous two iterations. Toffee and caramel is this series hallmark, liquid cracker jacks with booze. Sweetness is perfect for helping the mouthfeel flow. Syrup and leather. Complex and well integrated. Good beer, time to pop one of the 100% -bal ones soon. 750ml waxed bottle poured into a matching Bruery snifter. The brew appears a very dark brown color with solid 2 fingers light khaki head that fades leaving spotty lace. Aroma of raisons sweet caramel, molasses, dry toasty malt, booze and some papery oxidative qualities. Tastes raisony, toasty malt, cocoa, molasses and slight herbal character. Some oxidative notes pushing through adding great complexity and focus on the dryer side of the maltiness present. Less carbonation which actually feels more fitting of this big beer giving it a richer, creamier feel. Papery oxidation initially that gives way to lots of fruit like raison/prunes and a seemingly completely masked alcohol inclusion. The aftertaste has a bit of fall foliage feel with herbal bitterness contrasting the caramelized sugars.